London, 7th December 2016: The Military Wives Choir helped to ring in the festive season today by joining the Chelsea Pensioners to celebrate the food that has fed the forces for centuries. 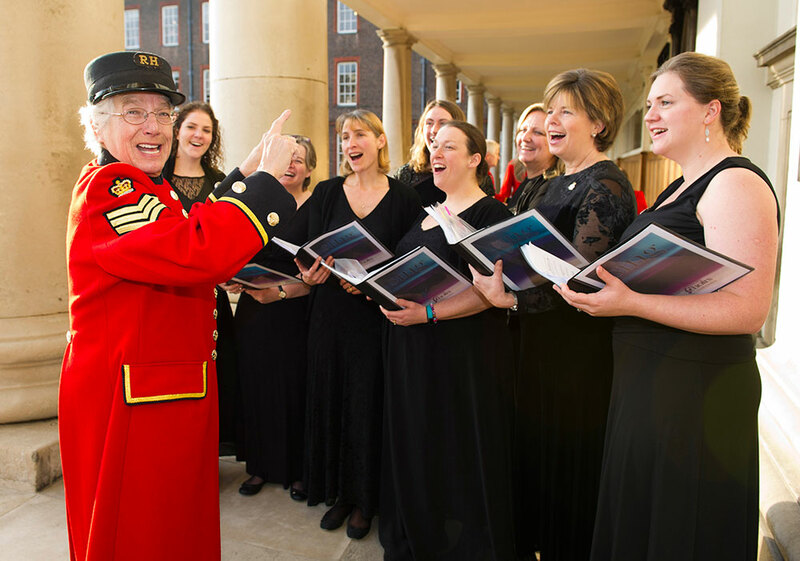 The Military Wives Choir were the guests of honour at this year’s annual Ceremony of the Christmas Cheeses at the Royal Hospital Chelsea in London, an event which dates back over 300 years and recognises the role of cheese in feeding the armed forces. The centuries old tradition began in 1692 when the Royal Hospital asked a local cheesemonger to provide the Pensioners with cheese as a Christmas treat. Cheesemakers across the UK have continued this tradition ever since. The Dairy Council has been arranging the donations for over 50 years, and this year a total of 246kg of British cheese has been donated to the Royal Hospital Chelsea. Vicky Ackerman, a member of The Military Wives Choir Windsor, said: “It’s such an honour to be invited to be a part of this great British tradition. The Pensioners are close to the hearts of people across the UK and it’s particularly heartwarming to stand alongside them to herald the start of the festive season. Ash Amirahmadi, Chairman of The Dairy Council, said: “We’re delighted to be celebrating the start of the festive season with the Chelsea Pensioners and the Military Wives Choir. Chelsea Pensioner Mary Johnston cut the ceremonial cheese during the ceremony, a 24kg Montgomery Cheddar donated by J.A. & E. Montgomery, which marks the first time a woman has ever cut the ceremonial Christmas cheese. Aged 92, Mary joined the Auxilliary Territorial Service in January 1942 and was stationed at Aldermaston and then Hounslow. She left in September 1945 having served for three years. Mary got married in 1943 to her first husband who was a member of the Welsh Guards Band. She had two sons one of whom was a Colonel in the Army Catering Corps and one who was a Warrant Officer in the Royal Engineers. Mary joined the Royal Hospital in January of this year and has had a busy and enjoyable first year as a Chelsea Pensioner living in Long Ward Four and attending many events. Mary said: “The cheese ceremony is a great day for us all at the Royal Hospital and we are delighted that Military Wives Choir have joined us in this year’s celebrations.